After our 9″ of snow on Thursday, today’s balmy temperatures in the high 30s with a bright, blue sky and warm March sun made me think spring. I had a wonderful day volunteering some time and my photography to the Blue Ridge Wildlife Center in Millwood, Virginia, and caught up with my birding partner Hillary. We spent most of the afternoon on a variety of projects, including releasing, feeding and rescuing a variety of birds. 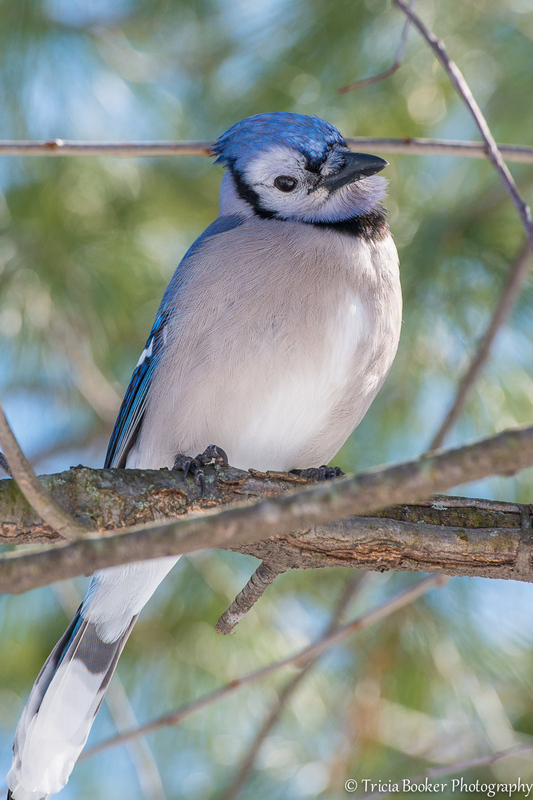 While we were out feeding the raptors, one Blue Jay begged us for a treat before dive-bombing us from a nearby tree. Unfortunately, we had nothing to spare, but he followed us around, perhaps hoping we might drop something. He made a very attentive model, however, and the next time I visit I’ll be sure to bring a few extra peanuts in my pocket to repay him for his time and efforts. What a great photo, Tricia! I love it!